This quick-and-easy recipe for Italian-style eggplant pickled in vinegar (melanzane sott'aceto) is typically served as an antipasto or hors d'oeuvre before a meal and often on a mixed antipasto platter together with other items, such as sun-dried tomatoes marinated in oil, for example, and some slices of hearty, crusty bread. 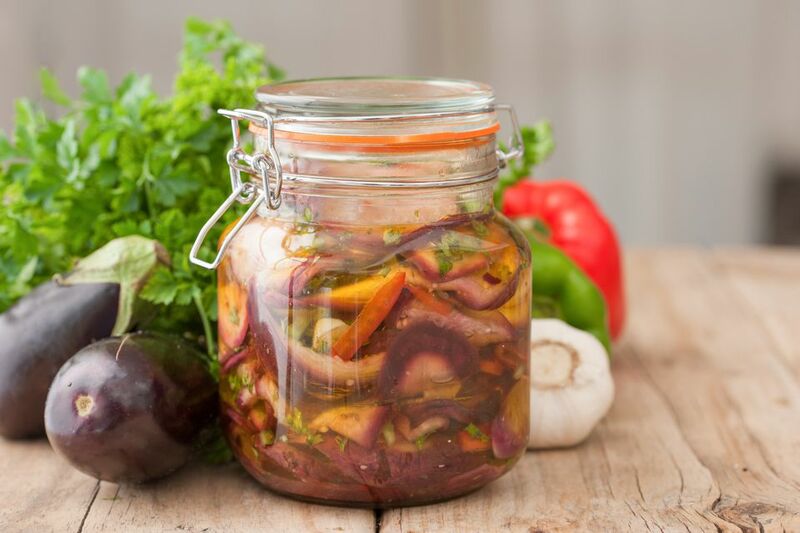 In Italian, pickled vegetables are referred to as sottaceti, which comes from sotto aceto, meaning "under vinegar." Some vegetables are preserved in olive oil instead, in which case they are called sottoli, but the vegetables must be cooked first. Pickled giardiniera (a mix of pickled vegetables including carrots, cauliflower, celery, etc., that is indispensable on an Italian-American sandwich) and pickled mushrooms are two more popular Italian condiments. Pickling started as a means to increase the shelf life of the bounty of summer and to preserve it for winter eating. What began as a necessity ended up becoming a taste sensation that was continued long after refrigeration became common and has entrenched itself in the culinary repertoire. You will need a one-quart jar or two-pint jars with screw-top lids, but this is a quick-pickle process that does not require a complicated canning procedure. Wash the eggplants thoroughly to remove all traces of dirt and pat them dry with a paper towel. Slice the eggplants into long strips (about 3 inches long and 1/4-inch thick). Layer the strips in a colander and mix liberally with kosher salt. Place the colander in the sink, put a dish on top of it, and put something heavy on top of the dish to weigh it down. This helps remove excess water from the eggplant. After 1 hour, squeeze the eggplant to drain out any remaining excess water. Transfer the eggplant to a large pot. Cover with 1 1/4 cups vinegar and 2 1/2 cups water (or for a larger batch, use the ratio of 2 cups of water to 1 cup of vinegar). Bring to a boil. As soon as it boils, remove from heat and allow the eggplant to cool in the water. In a large bowl, place the sliced garlic, parsley, optional mint and oregano, red pepper flakes (or fresh red chile pepper), and optional bell pepper. Squeeze as much water out of the eggplant as you can, and add it to the bowl. Pour in 1 to 2 cups of extra-virgin olive oil (at least 1 cup) and 1/4 cup of vinegar. Stir well. Transfer everything to a one-quart jar or two-pint jars that have been washed well (sterilizing isn't necessary but you can if you wish), pressing down to remove any air. Leave about 1 inch/3 cm of space at the top, and pour in some olive oil so that all the eggplant is submerged. What's important is that you not overpack the jars with the vegetables and in all cases fill them to the brim with oil or vinegar. Place the screw-top lids on, wipe the jars and store in the refrigerator. They should be ready to eat in 24 hours but waiting an extra day will only improve the flavor. The filled jars must be stored in the refrigerator for up to one month. Do not store them at room temperature.